Abuse occurs when someone violates the Second Life Terms of Service (ToS) or the Community Standards (CS). Every Resident agrees to abide by these rules upon joining Second Life. Some special areas, such as Infohubs, have additional restrictions called the Welcome Area Guidelines. Whenever you see one of these rules being broken and you believe it to be intentional or malicious, everyone present at the scene should file an abuse report. If there are multiple incidents, file multiple reports. File reports on any abuse you witness in addition to abuse that targets you personally. Not every Resident is aware of the abuse-reporting system or remembers to use it, so please help out your fellow Residents! Reports from multiple people underscore the seriousness of an incident. If you're being pushed or thrown around by scripts, right-click on an object and choose Sit Here. This stops you from being moved. On combat/damage-enabled land, shooting someone with a weapon is not abuse. Look for a little red heart in the menu bar, which indicates your health. If you can see it, you're in a valid combat zone, and weapons fire is permitted. Your avatar can't die permanently: even if you lose all your health, you will simply be teleported back to your home location. Using weapons on non-combat land is usually abuse unless the landowner has clearly allowed it, for example in a role-playing game. If a friendship has gone sour, block the person and remove him or her from your friends list. This will also remove any permissions you may have granted them, like the ability to track you on the map. Choose Help > Report Abuse from the menus at the top of your Viewer window. To directly report an object, right-click the object and select Manage > Report Abuse. The REPORT ABUSE window opens, displaying a snapshot of what is onscreen at that moment and the relevant identifying information if you selected an avatar or object. If the snapshot helps clarify the issue, check Use this screenshot. Screenshots can be very helpful visual evidence; include them whenever appropriate. If the report is about an avatar or object , click the button to fill in the relevant information automatically. Click Select category and choose a category. If you don't see a category for the particular incident you're reporting, use Select Category > Other and explain in the Details field. The Location of Abuse field is filled in automatically with your current location. Change to specify a different location. In the Summary field, write a concise, one-line summary, much like an email subject line. Be brief yet precise. Use the Details field to give as much pertinent information as possible to help Linden Lab assess the incident. Tip: If you don't know the offender's name, choose "Governor Linden" as a placeholder and explain in the report details. You receive an automated response by email. If you need to add more information after submitting a report, please submit a new report. We try to resolve abuse issues as quickly as possible, but response times vary depending on the number of backlogged abuse reports. For privacy reasons, we are unable to share the details of an investigation into an abuse report. Once your report has been submitted, we'll take it from there. Often all it takes to curtail an issue is an official warning. In most cases, a Resident who violates our Terms of Service and/or Community Standards is given several opportunities to rectify his or her behavior before banishment occurs. In all cases, the Resident's discplinary record is reviewed to determine an appropriate response. Serious abuse may result in account suspensions or permanent bans. The length of a suspension is determined by the nature of the abuse, previous violations, and how many people are affected. Tip: If abusive behavior is persistent, file abuse reports for each incident. The disciplinary process works only if we are made aware of ongoingly abusive behavior. The Second Life Terms of Service require all Residents be at least 16 years old, with the exception of 13-15 year old Residents restricted to the estate of a sponsoring institution. For more information, see Teens in Second Life. Make sure the person has actually admitted underage status in his or her own words in inworld chat (for example by saying, "I'm fourteen"). We cannot accept hearsay, rumors, or admissions made on external instant messaging programs or any areas outside of Second Life. 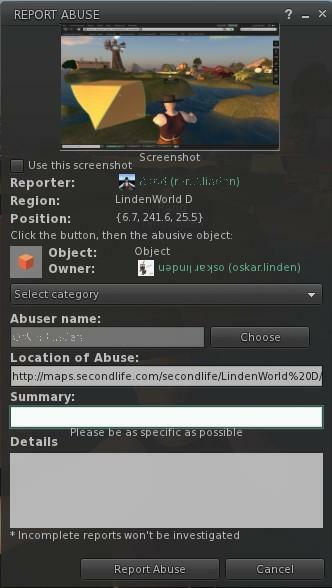 Inworld, use Help > Report Abuse to bring up the abuse report tool. Click Select category and choose Age. Enter the required information as indicated, and please be specific. If you recently heard an underage admission in chat, copy-and-paste the snippet into the Details field. If it happened earlier and you don't have a chat record, just recite as much as you remember to help us understand what to look for. Click the Report Abuse button and our Abuse Team will investigate it and take appropriate action. Thanks for your help. If the report is valid, Linden Lab puts the account in question on hold and requests age verification by email. To get the account off hold, provide a legible copy of a government-issued identification document (state ID, driver's license, passport, military ID, birth certificate) that clearly indicates the account holder's name and date of birth. This is the only type of identification acceptable for establishing age eligibility. You may send your ID via a support case, fax, or postal mail. The age verification process is usually resolved within a week. We do what we can to keep your accounts active in Second Life. If someone is harrassing you through voice, the best solution is to block this person. You can file an abuse report, but it's difficult to provide concrete evidence in such situations, since there are no IM or chat transcripts. For commonsense reasons, we cannot accept recordings of voice chat made by other programs or by holding a tape recorder up to your speakers. Click the People button at the bottom of the Viewer to open the PEOPLE window. Open the NEARBY tab, select the avatar, and choose Block/Unblock. A small red icon will appear next to their name. Note: If you IM with, pay Linden dollars to, or give inventory to someone you have blocked, he or she is automatically un-blocked.